The Grater Pod is a kitchen gadget from Progressive with S4ª technology Ð Sharp. Straight. Simple. Smart. This Grater Pod is part of our extra sharp S4ª grater series, designed to fit your kitchen, lifestyle and needs at a great value. 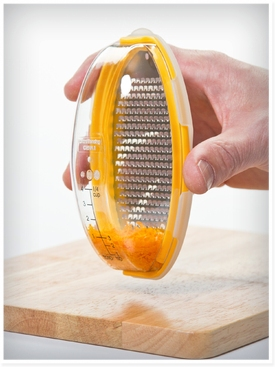 It is perfect for grating or zesting with less mess. Extra sharp etched surface for quick and easy grating or zesting. Unique angled blades cause food to move straight down the grater for more efficient grating or zesting. Grate or zest directly into clear container with printed measurements up to 1/4 cup. Fits easily in your hand. Snap on cover for safe and convenient storage. Perfect for chocolate, citrus, ginger, garlic and Parmesan.